​The Conservancy Corp., mission is influencing people, policies, structures and systems in order to bring about change. It is about communicating with those in power and persuading them to act in more just and equitable ways. At the core, it is about building relationships. It is about tackling the root causes of poverty and promoting justice. Through research, education, communication and collaboration, we seek to develop projects that will create the spiritual, social and political environment that culminates in policy solutions necessary to ensure consistent respect for nature and human rights. Through, the iCENTER Foundation, we are able to develop programs that address the issues directly impacting our communities. iCENTER provides programs and services that are geared towards STEM education, after school programs, job skills training, certifications, family counseling, legal services and helping residents of all ages. Success is cultivated through a combination of mindset, confidence, as well as practical skills. We prepare students by providing the technical training, specialized skill sets, certification (s), as well as the self awareness they will need to succeed in a future filled with uncertainty. 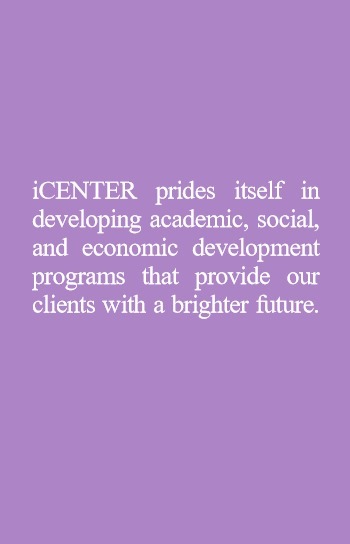 iCENTER Foundation provides programs and services geared towards STEM education, job skills training, certifications, family counseling, legal services and helping residents of all ages. iCENTER programs are based on the needs of families, and services are provided in collaboration with community partners. iCENTER provides Personal Development, Technical Education, Certifications, Employment Opportunities and afterschool programs. iCENTER has made strides in building alliances with various community based organizations. Our board of directors is fully committed to the mission and are dedicated to providing the training and empowerment necessary to secure gainful employment in high demand fields. There is a gap between the jobs that are available (i.e. sciences, green technology) and the skill set that are needed in those industries. We close that gap. Those of us who have worked with socially and economically challenged families, understand that these families often come with the deck already stacked against them in a variety of ways. Some are extremely low income, some have been out of school for years, and some have not been able to complete high school. Most are trying to balance unemployment with other responsibilities like housing needs, personal and family trauma, or legal matters, and may be combating these and other obstacles at the same time. Being unemployed or underemployed can be a time of stress and uncertainty. It is no longer possible to support a family with a high school diploma, a resume and a reference. Today, the gap to get from poverty to self-sufficiency is bigger than ever, requiring an income that is 3 1/2 times the federal poverty level. iCENTER stands as a direct service and referral forum for community programs and resources that can help the impoverished and vulnerable people achieve crisis assistance and sustainability.